Virtually every collector of German cigarette cards will have heard of Paul Hey as he drew the illustrations on quite a lot of cards. Albums of cards drawn by him proudly announce the fact although they generally give few further details of him, so we can assume that he was well-known in the 1930s. However nowadays very few people know who the man was. He was born on 19.10.1867 in Munich and studied at the Munich Academy under Raupp, Herterich und Loefftz. 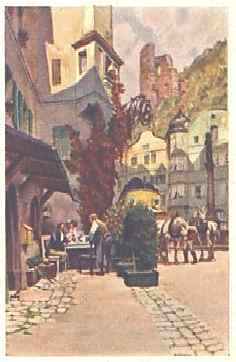 Around 1900 he was working for the Munich publisher Ottmar Zieher producing picture postcards along with other well-known artists such as Zeno Diemer and Heinrich Kley. Presumably it was during this time that he became well-known. He developed a unique style of poetical, realistic representations of old-fashioned subjects which make his work instantly recognisable and it was this style which made him ideally suited to drawing illustrations of subjects such as folk songs and fairy tales. In the mid-1930s he illustrated the Folk song albums of the Kathreiner company. Probably his most well-known set of cards is the set of Deutsche Märchen cards issued by the Reemtsma company which is still readily available even nowadays. He lived in Gauting near Munich where a street and a school are named after him and died in 1952.